The government has approved the immediate release of Sh2 billion to facilitate drought mitigation efforts in 13 counties which require immediate intervention. As cases of hunger-related deaths emerged in some parts of arid regions, the national government, through Deputy President William Ruto, reported on Monday that it had disbursed up to Sh1.4 billion for response in February, March and April 2019. The DP acknowledged that a total of 1,111,500 people in the 13 counties were facing starvation but insisted there was no cause for alarm as Kenya remains stable in matters food security. "There is no cause for alarm as the situation is not as bad as it was two years ago," he said when he appraised the nation on the status of the drought that has left at least four people dead. Dr Ruto also announced that Sh12 billion has been released for 1.2 million beneficiaries of the cash transfer programme for the elderly in drought-stricken areas to buy food. He urged counties to realign their budgets for emergency responses. On Saturday, Kositei sub location Chief Jack Ronei confirmed that hunger-related deaths had been reported in Kamusuk, Kositei, and Seretion, and that four people had died. Hundreds of livestock have also perished due to lack of water and pasture. 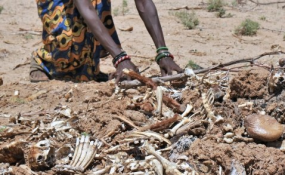 A report by the National Drought Management Authority (NDMA) blames the rising cases of food insecurity to below-average 2018 short rains, livestock diseases, invasions by pests and intercommunal fights in areas of northern Kenya where pastoral farming is practised. "The below-average short rains have slightly increased the food insecure population from 655,800 in August 2018 to the current 1,111,500, with the top 12 counties having a total of 865,300 food-insecure people," the NDMA report states. The 2018 short rains were generally late and erratic. The rains were 20-30 days late in the south-eastern marginal agricultural areas of Kitui, Makueni, Mbeere and Meru North. They were more than 40 days late in the northern pastoral and coastal marginal agricultural areas of Kilifi, Kwale, Taita Taveta and Lamu. Cumulatively, the southern parts of the coastal marginal agricultural areas, southern parts of pastoral north-western areas (Baringo, West Pokot, Samburu, Marsabit) and northern parts of north-eastern pastoral areas (Wajir North, Mandera, Turkana) received rains that were above 110 percent of normal. "The rest of the pastoral and marginal agricultural areas received less than 90 percent normal rains. Spatial distribution was poor across the country," the report says. "Temporal distribution was also poor throughout the season and was dominated by long dry spells between rainfall episodes. Rainfall cessation occurred earlier than normal during the second and third weeks of December."